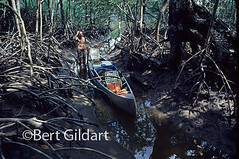 ©Bert Gildart: It’s been 25 years ago since Bruce May, then a biologist with Montana Fish Wildlife and Parks, and I canoed 100 miles of the Everglades Wilderness Waterway. I’m reminded of the event as we celebrated Bruce’s birthday two days ago. As we visited we realized that this month marked the anniversary of that adventurous outing. We reached Chickee late in the evening, after porpoise guided the way. At the time I was gathering information about national parks for a story for the United States Information Agency (USIA), and in many ways we lucked out. Spring in the Everglades can be a horrible time because of the bugs, but shortly before we arrived there had been an unusually cold spell and it killed most of the mosquitoes and the no-see-ems. As well, we didn’t understand much about tides, and one day our timing was all wrong, and though we were heading toward the ocean, tides on this vast “river of grass” were rising, and by day’s end, we were exhausted. Though what I’m about to relate seems preposterous, it’s all true. 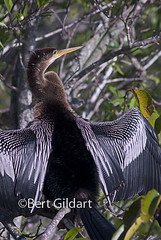 L to R: When the tide went out channels lost water forcing us to struggle with canoe; Anhinga, one of more common bird species; in an area called the “Nightmare” alligators were everywhere. Moments later, a dolphin swam into view, and we decided to follow it. Reversing our course, we managed to stay in sight and it soon led us to the correct channel, and then, soon, to the chickee. We erected our tent, put up a lantern, and then listened to all the night sounds, which were kind of spooky. Next morning we arose and discovered that our canoe was hanging from the bow rope and except for the very stern was completely out of water. Thankfully, we’d removed everything the night before, else much might have drifted away. Bruce has been a good friend most all of my adult life and it is wonderful to have friends with whom one can share past adventures. 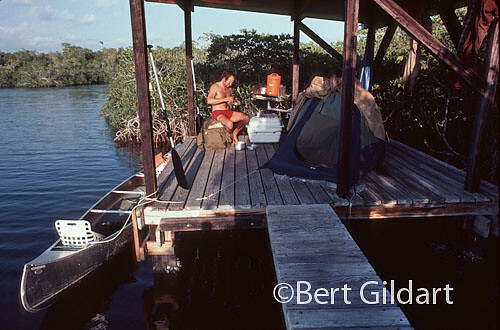 Canoeing the Everglades and its Wilderness Waterway was certainly one of the best. 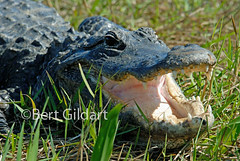 This entry was posted on Tuesday, March 29th, 2011 at 8:28 am and is filed under National Lands, Natural History/Conservation, Photography, Travel. You can follow any responses to this entry through the RSS 2.0 feed. You can leave a response, or trackback from your own site.